Since the 1970’s, Bulkmatic has been one of the largest and most trusted dry bulk transport companies in the country. A privately owned company, we realized early on that we had to provide the best possible value to our customers and that we had to make sure Bulkmatic Transport was the best place to work. This mantra has propelled us to become an industry leader setting the standard for sanitization, driver & employee training and engagement, safety and responsiveness. 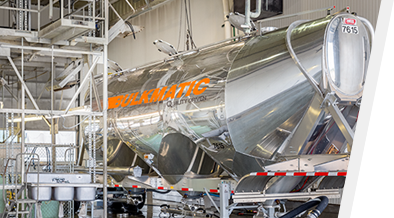 For years the industry’s largest food companies and plastics manufacturers have relied on Bulkmatic, making us the leading bulk logistics solution for bulk food grade, plastics and dry chemical products. Our extensive network of transloading facilities and warehouses throughout the United States and Mexico make us the perfect choice to help drive your business forward.